Diaphragm seal systems are particularly suited for measuring aggressive, highly viscous or crystalling media. When used with a capillary or a cooling tower, the diaphragm seal can protect the measuring instrument at high process temperatures. The diaphragm seal must be fitted with an instrument at our factory in order to make a well functioning gauge. 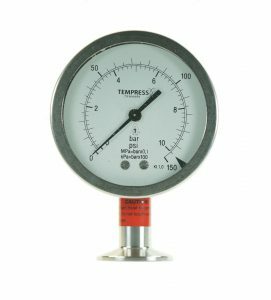 The fact that TEMPRESS is the manufacturer of both the diaphragm seal and the pressure gauge, ensures that the two parts work together in the best possible way. The pressure gauge is designed to withstand an overpressure of 30% pressure peaks without influencing the calibration. For specifications and selection of diaphragm seal, please refer to data sheet for each specific connection.